5 Stars / Classics / Science Fiction / Stevenson, Robert Louis / Strange Case of Dr Jekyll and Mr Hyde The / The Strange Case of Dr Jekyll and Mr Hyde / Tuesday Terror! Mr Hyde was pale and dwarfish, he gave an impression of deformity without any nameable malformation, he had a displeasing smile, he had borne himself to the lawyer with a sort of murderous mixture of timidity and boldness, and he spoke with a husky, whispering and somewhat broken voice; all these were points against him, but not all of these together could explain the hitherto unknown disgust, loathing and fear with which Mr Utterson regarded him. Because the story has become so phenomenally well-known, the reader is way ahead of Mr Utterson, the lawyer. In the novella, it’s not till near the end that it’s revealed that Mr Hyde is the result of a scientific experiment gone horribly wrong. But it’s so well written that knowing the story doesn’t hamper enjoyment in any way. Stevenson builds up the tension and horror beautifully, with one of the best uses of London fog I’ve come across, both as providing a cloak for wickedness and vice, and as a metaphor for the darkness within each human soul. Darkness features throughout, with fog rolling into houses, and Mr Utterson having to face the terrifying climax with only the feeble flicker of a candle to light his way. The Fredric March version from 1932. Hmm… no obvious deformity? A great chocolate-coloured pall lowered over heaven, but the wind was continually charging and routing these embattled vapours; so that as the cab crawled from street to street, Mr Utterson beheld a marvellous number of degrees and hues of twilight; for here it would be dark like the back-end of evening; and there would be a glow of rich, lurid brown, like the light of some strange conflagration; and here, for a moment, the fog would be quite broken up, and a haggard shaft of daylight would glance in between the swirling wreaths. The dismal quarter of Soho seen under these changing glimpses, with its muddy ways, and slatternly passengers, and its lamps, which had never been extinguished or had been kindled afresh to combat this mournful reinvasion of darkness, seemed, in the lawyer’s eyes, like a district of some city in a nightmare. The Spencer Tracy version from 1941. Ah, much better! I thus drew steadily nearer to that truth, by whose partial discovery I have been doomed to such a dreadful shipwreck: that man is not truly one, but truly two… If each, I told myself, could be housed in separate identities, life would be relieved of all that was unbearable; the unjust might go his way, delivered from the aspirations and remorse of his more upright twin; and the just could walk steadfastly and securely on his upward path… no longer exposed to disgrace and penitence by the hands of this extraneous evil. There is more than an element of morality tale about the story. Dr Jekyll has always liked to indulge his vices – mostly left, incidentally, to the reader’s imagination, which works so much better than lengthy graphic descriptions would have done. But now that he has become a well-known figure, he has to think about his reputation. So he decides the solution is to split his personality between good and evil. But the experiment doesn’t work the way he hopes – the Hyde side is indeed purely evil, but the Jekyll side doesn’t change – he still retains all his vices and weaknesses even when in that guise, and gradually the Hyde side begins to take control. The suggestion is that, if one gives in to one’s evil side, it will always become dominant, so we must guard against it at all times. It’s not nearly as preachy as I’ve probably just made it sound, though. First and foremost, it’s a thrilling, chilling tale of horror! book review, classics, Film of the Book, horror, robert louis stevenson, science fiction, The Strange Case of Dr Jekyll and Mr Hyde, tuesday terror! I am pleased to hear you enjoyed this so much; particularly after you didn’t enjoy Kidnapped. Sadly I found this rather disappointing when I read it quite a few years ago now. Since then I have loved Treasure Island and I found Kidnapped pleasant. So perhaps I need to give this another chance; especially as you’ve made it sound far more tense and multi-layered than I ever remember! I think I enjoyed this more than when I read it years ago, maybe because I’ve been so steeped in horror stories over the last year or so that I now look at them a bit differently to see how they’re written, as much as for the actual chills. I loved the whole fog and darkness thing in this, which I might not have paid as much attention to before. Definitely worth a re-read, I think – and it’s nice and short! I loved Treasure Island but really found Kidnapped dragged, especially in the middle. One of the finest books ever written and the fact that the story is so well-known is testament to its brilliance! I was never taken with Treasure Island, I must say – even though I desperately wanted to love it. Good to see the fretful porpentine making an appearance – he is a splendid chap! Very true. Ah, cinema’s obsession with gorgeous women. I suppose they must have some benefit or they wouldn’t keep popping up. What’s wrong with a nice, ordinary lady I say! I read it long years ago. When I was … ummm maybe 12? The story was more interesting then my age. It was horrifying to me. Things like that had never happened where I lived. Things have changed. It’s almost like some of these authors have a prophetic bent. It’s great, isn’t it? I recently read a book about London fog (called London Fog surprisingly!) and how it was used by writers and artists to create atmosphere, so I’ve become very conscious of any references to fog at the moment. And Stevenson really uses it brilliantly! If you do get a chance to re-read it, I hope you enjoy it just as much again! Isn’t this a fantastic story, FictionFan? I’ve always loved the way Stevenson was able to create such a moody, even gothic atmosphere. And of course, the story itself is really chilling. Love it! An outstanding story, one I remember reading years ago. I particularly enjoy Stevenson’s writing style here — chilling to the bone, you know. Glad we finally found one we agree on, too! 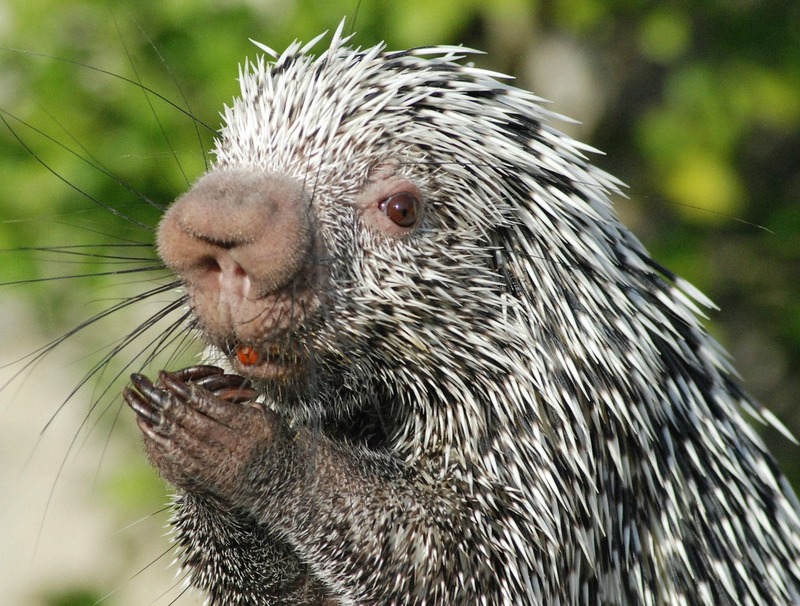 And seeing that porpentine with its little paws clasped prayer-like is a special treat! Ha! Yes! It’s always great to agree about a book – though sometimes disagreeing can be fun too… 😉 It’s brilliant, isn’t it? I thought I might be so familiar with the story I’d find it dull, but he builds up so much atmosphere that it’s still amazingly tense. Great stuff! And I love that little porpy…! So good to hear you enjoyed this one so much – as you say it is so well known which is testament to the author! A brilliant review that almost makes me want to revisit this one and explore it again. Love this book! He’s one of the most evocative writers I’ve ever read…which sticks out to me because most description in a book is wasted on me. I just can’t see it…but I can with him! Though I didn’t take as much note of the fog last time I read it. I’ll have to go back and look for that. I have this strange sense of deja vu…did you review a different edition of this book? Very odd. Am I losing my mind? Do I have a split personality? Am I who I think I am? I just booked a two man play of this today! I have never read it, maybe because I too hated Kidnapped. Great review. I of course am a Stevenson “nut” – I loved all his books, even the less well known ones like Prince Otto and The Black Arrow. I can’t believe I didn’t force-feed you J & H at a much earlier age – what was I doing? I started much earlier: I got Kidnapped and Catriona as a school prize when I was nine and was hooked for life. I read everything else within a year or two. Since you mentioned the movies, did you ever see Mary Reilly? It’s the J&H story told from the perspective of a housemaid. I started watching it fully prepared to hate it and maybe not even finish it, but it was surprisingly good. I haven’t read this since high school! I liked it then. And I’ve never seen a film version of it. Glad you enjoyed it. Doy! I didn’t even think to look at YouTube! Smart lady. Oh cool! I like that the reader–if they didn’t know the story–wouldn’t know what Hyde was about really. That’s really neatio. You should watch Abbot and Costello’s version, haha. I think that’s a fake stuffed animal! I won’t knock you on the head! What a thought. Still, it’d be cool to forget all about it. But it speaks volumes that it was still interesting even though you knew about it. My shillelagh! That is like so hard to spell. I grew up watching that, can you believe! i think I have it memorized. Well, you call it c&a, but what about all the spikes on its back? Hahahahahahaha. Funny you admitted that. It’s so odd, in truth. Tell you what, just abbreviate it from now on… I’ll know what it is, promise. Abbrev: Sh. Oh I bet you could wield it very cool like a lady. I heard Lizio looks cool in P&P&Z welding her katana. Not at all, I assure you! Definitely so much more exciting than Kidnapped! 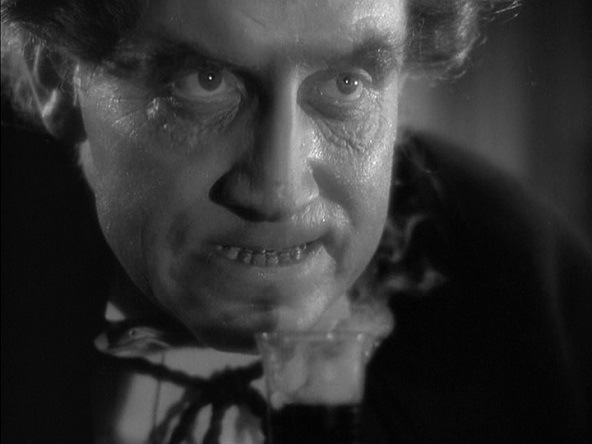 I also like that the movies all seem to have decided that Mr. Hyde would have terrible teeth! I recently bought the Oxford Classics edition of this book. Excellent short novel. 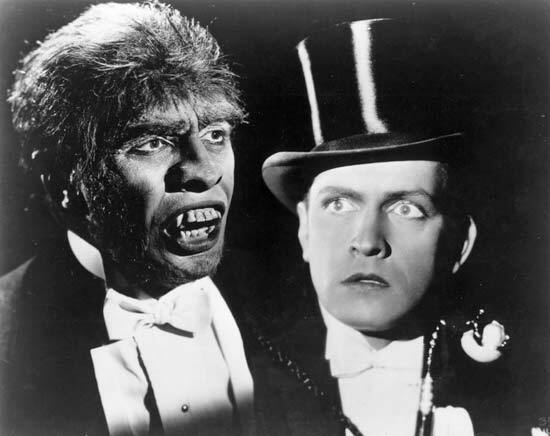 Though Treasure Island is my favorite, Strange Case of Dr Jekyll and Mr Hyde is a close second.